I started thinking about Enterprise as an employer when a local recruiter reached out to me on LinkedIn, after that I went online and checked some reviews and came to find out that it was an awesome entry-level program. 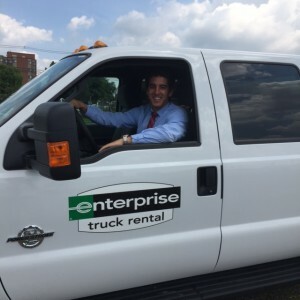 I started at a rental branch in our Kentucky operations as a Management Trainee, which I loved because it was a pretty busy branch so I learned my role very quickly. After 4 months, I transferred to our airport location. After a short time at the airport, the position for Account Specialist in our Truck Rental business opened and I was promoted to that role. .I have since been promoted to Assistant Branch Manager in our Kentucky Truck Rental operations. The opportunities to grow within Enterprise Holdings – I have the opportunity to grow my career without changing companies. My life in competitive sports has helped me tremendously with my career at Enterprise.The experience and competitive sports in general have a lot in common with the Enterprise work environment. The competitiveness and tangible goals we have at Enterprise is just like what you have in sports. You set your goals, you know what you have to do to reach them and you work hard to achieve them. Beijing (’08) was one of the best experiences of my life. Since my big goal for the year was making the team, once I was on the team and in Beijing I could truly enjoy it. From the opening, to my race to the goodbye, everything was a one-of-a-kind experience. China was very prepared to run the event and I felt like everyone was there to see you and cheer you on. My second experience in London was very different. Of course, it was still magical to be there and be surrounded by all of the talented athletes. But, I was just not happy to be there this time, my mindset was more on the outcome of my performance. I still enjoyed the experience immensely and am proud to have been able to represent my country!